TUCSON, Ariz. -- Gilberto "Zurdo" Ramirez wasn't about to let Jesse Hart take his super middleweight world title. In a hard-hitting slugfest, Ramirez dropped Hart in the second round, hit him with numerous clean punches and worked him over the body en route to a unanimous-decision victory on Friday night before 4,103 at the Tucson Arena. Hart (22-1, 18 KOs), 28, the mandatory challenger from Philadelphia, was trying to win the title for his father and trainer, Eugene "Cyclone" Hart, who was a top middleweight contender in the 1970s. He fought everybody, including losing by eighth-round knockout to Hall of Famer Marvelous Marvin Hagler in 1976, but never got a title shot. Jesse Hart's goal was to win and wrap the belt around his father in the ring after the fight, and although he was game and showed enormous heart, Ramirez, who retained the 168-pound belt for the second time, was the clear winner in the co-feature of the Top Rank ESPN card headlined by featherweight titlist Oscar Valdez's defense against Genesis Servania. Two judges scored the fight 115-112 and the third had it 114-113 for Ramirez, who seemed to be much more dominant than the scorecards indicated. ESPN.com scored the fight 117-110 for Ramirez. "This one was for all the Dreamers, all the people of Mexico and what they are going through with the earthquake," Ramirez said. "The plan was push, push, push and put a lot of pressure on him and keep him off balance. I wanted to put on a really big body attack every round. We wanted to keep him off balance. This was a very tough fight. There was nothing easy in this fight." Hart got off to a good start. He boxed and moved and landed some solid punches over Ramirez's lazy jab, but it was a totally different story in the second round. Ramirez had a huge round. He dropped Hart early with a clean right hand and then punished him for virtually the entire round. He lashed him with power shots from both hands and had him nearly out and referee Michael Ortega looking closely. Hart's balance was a mess but he made it out of the round. In the third round, Ramirez (36-0, 24 KOs), a 26-year-old southpaw from Mexico, badly hurt Hart with a low blow. Ortega warned him and gave Hart time to recover. But Ramirez continued to attack him with right hands and Hart could barely defend against them. Ramirez continued to work Hart over in the fourth round. Hart stayed on his feet only because of his heart -- Ramirez continued to pound him with punch after punch as Ortega once again appeared on the verge of stopping the fight as Ramirez landed 40 of his 70 power shots, according to CompuBox. The pace slowed some in the middle of the fight, but Ramirez continually backed Hart into the ropes and fired straight left hands and right hooks to the body. Hart's corner knew he was losing because assistant trainer Danny Davis kept shouting that Hart needed to take chances. He tried but Ramirez walked through his shots and hurt him to the body with a series of digging punches in the ninth round. A left to the body really hurt Hart, who backed into the ropes. Hart had to know he needed a knockout in the 12th round and he went for it, but Ramirez stood his ground in an action-packed round. "I take nothing away from him. He's the champ," Hart said. "He's a good champ. He has my respect. The knockdown was my fault. That was the difference in the fight. Zurdo's a really good fighter." According to CompuBox, Ramirez landed 220 of 690 punches (32 percent) and Hart connected with 132 of 497 (27 percent). Featherweight prospect Michael Conlan, the popular two-time Irish Olympian, slugged it out with Kenny Guzman before knocking him out in the second round of their scheduled six-rounder. Conlan (4-0, 4 KOs), 25, turned pro in March with great fanfare -- his buddy, UFC star Conor McGregor, walked him to the ring at the sold-out Madison Square Garden Theater -- and scored third-round knockouts in his first three bouts. This time it didn't last as long. Conlan and Guzman began to trade from the outset of the fight and each landed right hands. But Conlan was doing more damage. 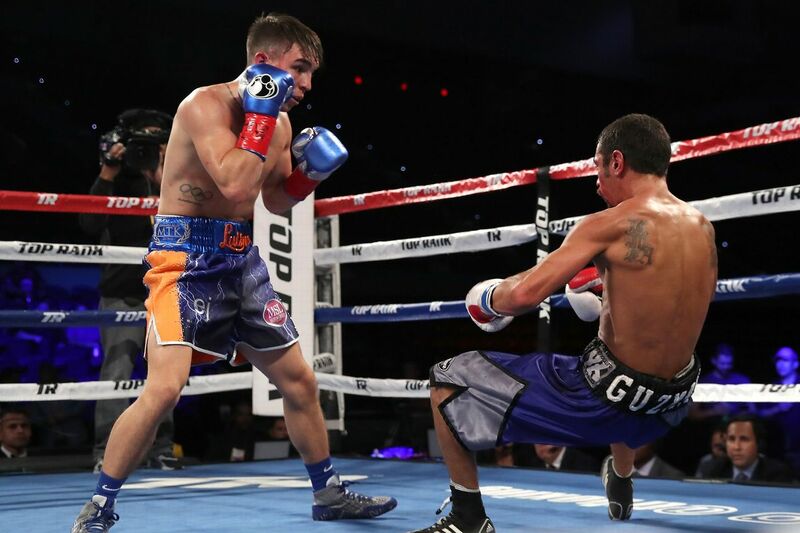 He began to go hard to the body in the second round, and although Guzman got in some shots, Conlan pounded him. Late in the round, he landed a powerful right hand on the chin and Guzman (3-1, 1 KO), 30, of Kalispell, Montana, went down. He beat the count but was unsteady when he rose and referee Wes Melton waved off the fight with one second left in the round. "I felt a bit nervous in the beginning. I don't know why," Conlan said. "I got a little reckless in the beginning and then began to work the body. He never hurt me." Trainer Manny Robles was happy with the performance. "I thought he did very well, but I'd like to see him keep his hands up a little more," he said. Conlan is due back in the ring on Dec. 9 at the Theater at MSG for his next fight when he will box on the undercard of junior lightweight titlist Vasyl Lomachenko's defense against Guillermo Rigondeaux. Junior lightweight Robson Conceicao (5-0, 4 KOs), 28, a 2016 Olympic gold medalist from Brazil, battered and befuddled Carlos Osorio (13-8-1, 5 KOs), 27, of Nicaragua, in a third-round knockout victory. If Conceicao wasn't stuffing punches in Osorio's face, he was juking and moving so Osorio could not land a thing. After the third round, Osorio retired on his stool, claiming he threw his right shoulder out on one of his many missed punches. Welterweight Egis Kavaliauskas (18-0, 15 KOs), 29, a 2008 and 2012 Olympian from Lithuania, stopped Mahonri Montes (33-7-1, 22 KOs), 27, of Mexico, in the seventh round of a hard-hitting fight. Montes, who was coming off an upset-decision win against Francisco Santana in April, landed his share of solid punches, but Kavaliauskas did far more damage with his shots, including raising swelling around Montes' right eye early in the fight. The swelling continued to get worse, and before the seventh round there was a delay while the ringside doctor examined Montes. The fight was allowed to continue, but as Kavaliauskas pounded away, referee Anthony Zaino waved it off 34 seconds into the round. With the win, Kavaliauskas, who fights out of Oxnard, California, won a regional belt and then called for a bigger fight. "This is my first belt. I've never won a belt before in my life," he said. "I knew it would be a hard fight and it was a hard fight. Now there's only one guy I want -- [welterweight world titleholder] Jeff Horn." Lightweight Mikaela Mayer (2-0, 2 KO), 27, a 2016 U.S. Olympian, pummeled Allison Martinez (1-3, 1 KO), 35, of Spring, Texas, until Martinez's corner stopped the fight in the third round. Mayer landed virtually at will, dropped her in the first round with a right hand and again in the third round with a right hand, after which the corner threw in the towel at 39 seconds. But between the knockdowns, Smith took an absolute beating that referee Wes Melton did not seem interested in stopping. "She took a lot of hard punches. I hit her very hard," Mayer said. "My right hand was working really good and she ate a lot of punches. I felt good and relaxed." Junior welterweight Fazliddin Gaibnazarov (3-0, 1 KO), 26, a 2016 Olympic gold medalist from Uzbekistan now fighting out of Los Angeles, pasted Victor Rosas (9-7, 3 KOs), 29, of Mexico, with every shot in the book for eight rounds en route to a shutout decision. Gaibnazarov, a southpaw, won 80-72 on all three scorecards but could not put Rosas on the canvas despite hammering with clean punches nonstop. Rosas lost his third fight in a row. Welterweight Lenny Zappavigna (36-3, 26 KOs), 29, of Australia, dominated Fidel Monterrosa (38-14-1, 30 KOs), 29, of Colombia, en route to a third-round knockout. Zappavigna was coming off an eighth-round knockout loss to Sergey Lipinets in a grueling junior welterweight world title elimination fight and moving up in weight. He took it to Monterrosa, dropping him three times in the third round. He beat the count after the third knockdown, but referee Zaino called it off at 2 minutes, 48 seconds.